Contemporary luxury meets a medieval mosaic in London Calling, the latest collection from luxury leather goods specialists Mark/Giusti. He was born in Lebanon, grew up in Libya, and travelled from place to place throughout his formative years due to his diplomat father’s itinerant vocation. And, in all those years as a peripatetic young aesthete, it was a singular art form, mosaics - Byzantine masterpieces in what was once Ancient Constantinople, tiled splendour in the basilicas of Venice and Ravenna – that inspired Mark Farhat, the most. Decades on, the soul-stirring geometric elegance of tessellation remains a signature aspect of the stunning bags, accessories and other leather-ware produced by his brand, Mark/Giusti, which he founded in 2009. And it’s one particular mosaic - the intricate Cosmati pavement in front of the High Altar at Westminster Abbey, on which no less than 38 kings and queens have been crowned – that inspired his collection “London Calling”, which is named after an adopted home city he describes as a “volcano of inspiration”. The overcoming of adversity has been a major theme in Farhat’s life. The cancer he was diagnosed when he was 16 would return five times, yet that didn’t stop him doing a B.A. in business administration in Beirut, before coming to London to study marketing management with an emphasis on consumer behaviour and branding for luxury brands. A design degree in Milan followed – “I did mainly technical work because I wanted [to work with] bags and accessories,” he has told The Rake magazine – then a position which involved moving between New York and London, which ground and whetted his business credentials. The kernel of his own business was the provision of small bespoke products for private customers, but word spread – with Pitti Uomo appearances amplifying his message to au courant dandies who value aesthetics, design, detail and practicality to shouty logos – and the brand’s vertiginous ascendancy now seems set to have no ceiling: luxury boutiques and department stores across the US, UK, Asia and Europe have all been seduced by the brand’s timeless simplicity and Italian craftsmanship, and it’s now stocked in 17 international countries. And, indeed, by us at The Rake, which is proud to offer highlights of an accessories line which will add more than a soupçon of subtle flamboyance (no oxymoron in our world) to the most catholic of wardrobes. 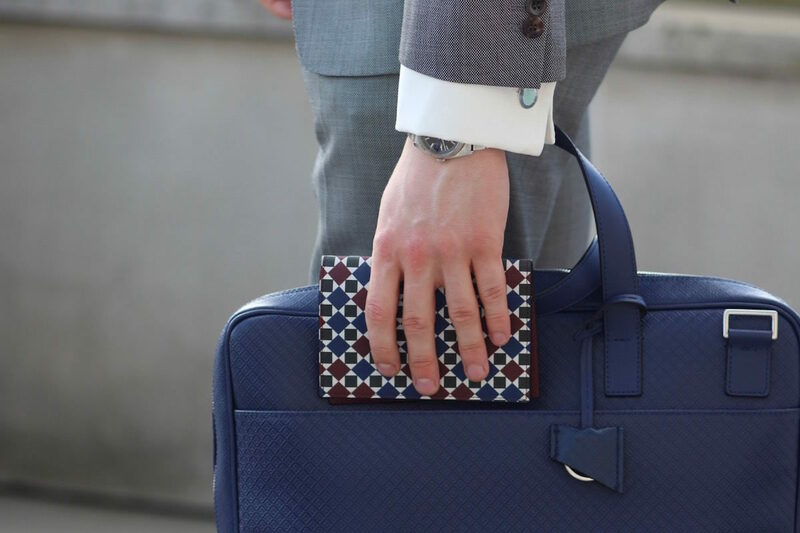 The collection consists of clean-cut document bags, laptop and iPad cases, passport holders and messenger bags, with soft calfskin the leather of choice throughout, while a stunning signature colour palette is made up of Port Red, Thames Blue, Westminster Green, London Nights and Midnight Navy. The Oxford laptop bag (“I gave the products historic names that would stand the test of time and that would be immediately synonymous with the UK,” says Farhat), which fits a 13in or 15in laptop, features a removable and adjustable leather shoulder strap and two interior pockets. Whichever colour you opt for, it offers versatility in spades (casual-tweed ensemble, business suit, roll-neck-and-jeans – this complements the lot). Similarly, the Notting Hill laptop cover - which features the same subtly embossed diamond criss-cross pattern - need have no bearing on what else you select from your wardrobe on any given morning. The forward-slash back strap, which means you can secure it easily to a trolley, makes it the perfect travel accessory. Bolder consumers, meanwhile, will surely be seduced by the red, blue and green, ultra-distinctive diamonds-and-squares pattern featured in the cotton sateen linings or exteriors (your choice – feeling bold?) of the collection’s various pieces.